Please don't hesitate to contact us with any questions or comments you may have! The museum and library are open to the public Tuesday through Saturday (closed on holidays), 10AM to 3PM. Special appointments for museum or library use can be made in advance (call for details). We ask a $3.00 donation per adult during your visit and children visit free. Members enjoy the museum free of charge and we welcome tour groups (call for details). Problems or issues with the website should be sent to the website maintainer, John Van Essen. 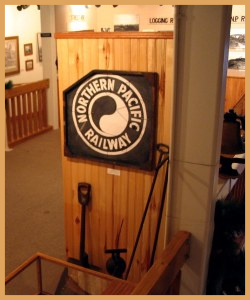 The railroads exhibit on the museum's 2nd floor; this Northern Pacific Railway stencil was used to mark railcars at the Northern Pacific car shops in Brainerd, MN.